How much tension should I tighten the flat top to? In other words, "should I really tighten up the ends as much as possible?" I occasionally have a customer that will email or call and tell me that the antenna has failed and the wire has broken near the center feedpoint. This is not a failure of the strength of the wire or, the quality of the construction; it’s a failure of the installation. I realize that as a customer, it's not what you want to hear. As a former restaurant owner, I can tell you honestly, the customer isn't always right! Here's what you MUST keep in mind. I have a 160M doublet suspended between two large, white birch trees. The antenna flat top is 220', end to end. The ends are up at roughly 60-80'. I have about 88' of feedline going to my 4:1 Balun Designs 4113T mounted on the side of the house. The center feedpoint of the doublet is roughly 35-40' above the ground. So, you can surmise that I have left a fair amount of slack to allow for the trees to move when the wind blows. I pull tight on each end until I can no longer take up any slack. Then I release about 10' or so on each end & check to see where this leaves the center height. If I feel I can drop it more, I allow more slack on each end. So many hams feel they must have the radiators as tight as possible and don't want to see any slack whatsoever. I'd rather have the slack than have to repair my antenna when the winter winds blow. I live at about 1,800' elevation in the mountains of Vermont. We face west and have a clear view to the Adirondacks and Whiteface Mountain. We get some tremendous wind, snow and ice. If I didn't allow slack, it would never last. 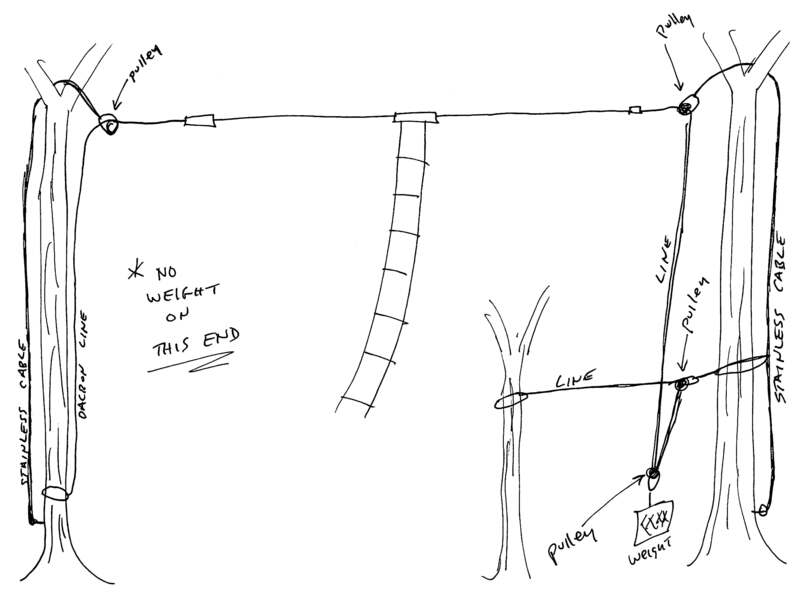 My suggested method is to use a counterweight system, such as the one shown below. I have had this one setup for nearly fifteen years for my 80M doublet, with ZERO problems, EVER! I check the Dacron line every year and replace if needed. This is my preferred way to do it. So, be sure to leave plenty of slack when you are using trees as your supports. I have many customers that use either steel or fiberglass push up poles or even towers as the ends. This will not require as much slack but you should still leave a little bit. Better safe than sorry! If you have any questions, please email me first and we will discuss it.